Here's me talking about the art-cakes, before they're gone! One happy house warming party-goer! I’ve always been a big fan of food; at family gatherings it was always ‘Susan will finish it’. And, of course, I’ve always been a big fan of art. It was after a few trips to the US however that the fascination with the link between the two really began to kick-in. In my mind a visit to galleries in Manhattan’s Chelsea wouldn’t be complete without a trip to a bakery. Just as I couldn’t shake the sight of Jeff Koons’s big, shiny yellow puppy on the roof of the Met (and the urge to hug it), there’s something equally enthralling about about dozens of bright, impeccably-iced cakes all perfectly arranged in rows, calling to be eaten; so when I got home, I baked my own. Fast forward a few years, I’m assistant blog editor at Tate and a professional baker on the side. This summer, I baked a couple of art-inspired cakes as part of our campaign to celebrate the new Tate Britain. We made a social media call out for you to do the same, and I loved what you shared. There was Liza Adamczewski’s brilliant ‘Rothko tray bake in purple black and grey’ suggestion, and a minimal, David Nash inspired ‘exotic black pyramid, cube & sphere’ suggested by Treasure and Relish. 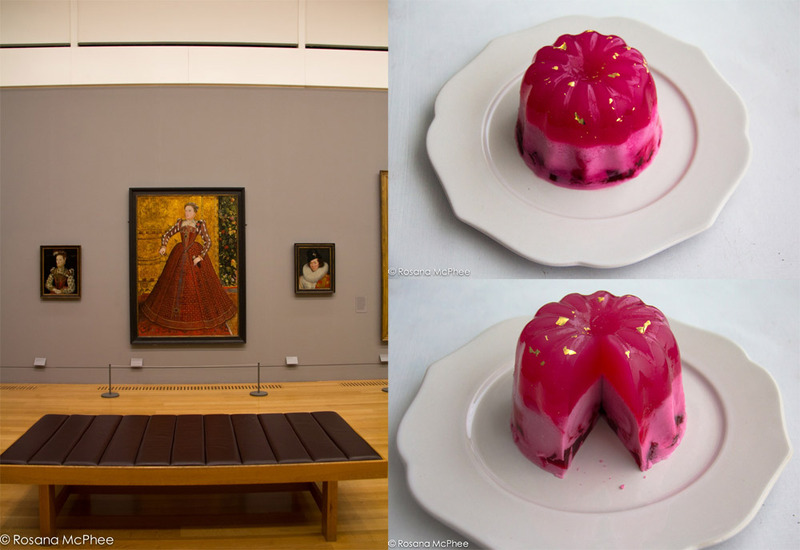 Food blogger Rosana McPhee whipped up a wonderful strawberry and coconut jelly inspired by Elizabeth I’s skirt in Stephen van Herwijck’s c.1563 painting. You could almost smell the sea in Kaleem Hyder’s crab linguine inspired by Turner’s The Sun of Venice Going to Sea, and can pretty much taste Turner’s Sunset in Bice Perrini’s vegetable paste toast painting. Then there’s Katie Glass’s beautifully simple take on Epstein’s Jacob and the Angel, where two pink jelly babies have an uncanny similarity to the pale pink alabaster figures. It was a lot of work but also the most fun I’ve ever had making cake! I loved how Mrs Meyer’s voluptuous ‘fancy’ skirt is the soft colour of strawberry blancmange with creamy silk layers peeking-out underneath. The dynamism of Bomberg’s figures cutting-through the blood-coloured background in The Mud Bath never fails to capture me (and turns out the offcuts of coloured cake did a pretty good job at representing this); and how can you not be inspired to make sweet treats when faced with the carefully embroidered strawberries on Lady Anne Pope’s jacket, and her standing in front of a fruitful cherry tree? You seemed to love it too as it took just 15 minutes for the cakes to disappear. To those who could make it, thank you for coming and supporting the art-cake cause. For those who couldn’t, try giving it a go at home and tweet your pictures to us @Tate.